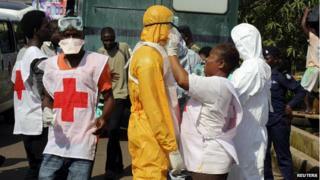 The UK is to give an extra £80m of aid towards the fight against the deadly Ebola outbreak in West Africa. The pledge was announced by Prime Minister David Cameron at a European Council summit in Brussels, and brings Britain's total contribution to £205m. Further pledges were expected to take total EU contribution to Sierra Leone, Liberia and Guinea to above £552m. But Mr Cameron, who said Ebola and the economy were the big risks facing the EU, urged other leaders to give more. Last week he suggested the EU donate 1bn euros (£789m) in response to the disease, which has killed more than 4,800 people in West Africa. About £50m of the new UK money will go towards 200 Ebola care units across Sierra Leone; £20m will go into a UN trust fund, and £10m will provide support for burials in Sierra Leone. European Commission president Jose Manuel Barroso pledged 24m euros of new EU funding to speed up medical research into treatments and vaccines. However, as the 28 EU leaders discussed the outbreak over dinner, Mr Cameron told them: "We can all do more. We should all do more." As he arrived at the summit, Mr Cameron warned that the virus could spread to Europe if it was not stopped. "It is very important we take action at source in West Africa," he said. "Britain has been leading the way in terms of Sierra Leone... But we need other countries to do more." The UK, US and France are respectively taking the lead in Sierra Leone, Liberia and Guinea - the three countries worst-affected by the current outbreak. In all, Britain is deploying 750 military personnel, including the Royal Navy's casualty ship RFA Argus. A further 780 British health staff volunteers are also helping to cope with the crisis. In the UK, screening for passengers from affected countries started at Gatwick Airport on Tuesday. It comes after Heathrow began screening last week. Screening for Eurostar passengers arriving at London's St Pancras station, along with passengers at Birmingham and Manchester airports, is expected to start soon. Meanwhile, Mali - which borders Guinea - has announced its first case of Ebola, in a two-year-old girl.